Put your feet up after a long day – you deserve it! After a long day when you have an aching back paired with tired feet what’s better than relaxing in your favourite chair with your feet up? Nothing! This smart, compact and innovative footrest by Jocca has been especially designed to alleviate your back pain whilst sitting. Very stable in all positions, the Jocca footrest is sturdy, reliable and comfortable. 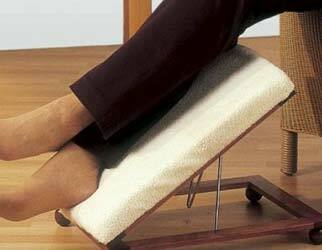 The footrest incorporates a comfortable cushion which will keep your feet feeling relaxed. The adjustable footstool is easy to clean, and folds flat for easy storage eliminating even more stress from your daily chores and routine. Crafted with care the Jocca footrest won’t let you down. Treat yourself! How does the folding footstool help with back pain? When your feet are elevated, the muscles in the front of your legs and pelvis relax. Because these muscles affect the bones and discs of your lower back, when they are allowed to relax they stop pulling down and compressing your spine.